Green River était un groupe de rock indépendant américain originaire de Seattle qui fut actif entre 1984 et 1987. Il eut une influence notable sur les débuts du son rock de Seattle connu sous le nom de "grunge". Mark Arm (chant) et Steve Turner (guitare) fonderont Mudhoney en 1988 avec Dan Peters (batterie), et Matt Lukin (basse). Stone Gossard et Jeff Ament formeront Mother Love Bone et Pearl Jam. "10,000 Things" et "Your Own Best Friend" sur Deep Six compilation (C/Z Records, 1986). "Searchin' (Good Things Come)" sur la compilation Motor City Madness (Glitterhouse Records, 1988). "Hangin' Tree" sur la compilation Sub Pop 200 (Sub Pop Records, 1988). "Swallow My Pride" sur la compilation This House Is Not A Motel (Glitterhouse Records, 1989). "Hangin' Tree" sur la compilation Sub Pop Rock City Glitterhouse Records, 1989). "Bazaar" and "Away In Manger" sur la compilation Another Pyrrhic Victory: The Only Compilation Of Dead Seattle God Bands (C/Z Records, 1989). "Ain't Nothing To Do" sur la compilation Endangered Species (Glitterhouse Records, 1990). "Baby Takes" sur la compilation Afternoon Delight: Love Songs From Sub Pop (Sub Pop Records, 1992). 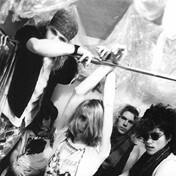 "Swallow My Pride (1987 Demo)" sur la bande originale Hype! (Sub Pop Records, 1996). "This Town" sur la compilation Wild And Wooly: The Northwest Rock Collection (Experience Music Project/Sub Pop Records, 2000).